Dutch Bangla Bank HSC Scholarship Result: Dutch Bangla Bank HSC Scholarship Result has been published on their website on 25 July 2018. It is available on their official website. If you don’t know DBBL Official link, you will help you to apply for Dutch Bangla Bank HSC Scholarship 2018. Those students who were passed the HSC or Equivalent examination in 2018 and got a GPA 5.00. In the intercity, the corporation needs to minimum Golden A+ that means all subject plus. But the out of the city corporation area student must have 4.50 without 4th Subject. 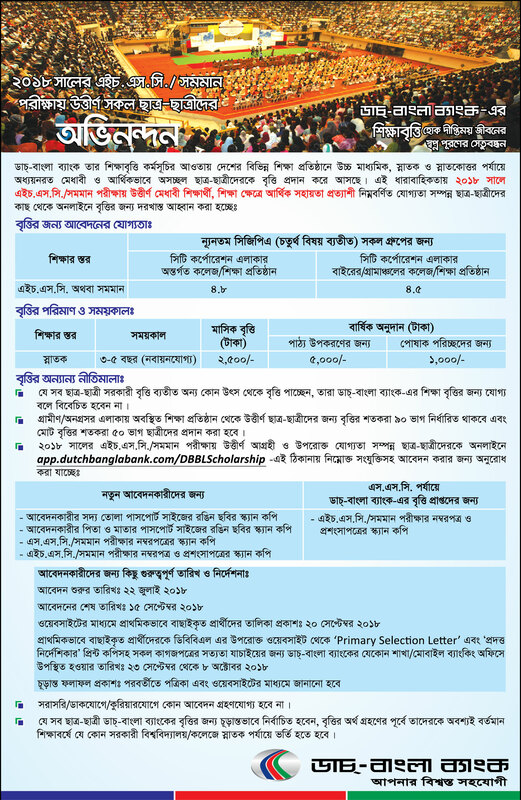 Important Document Submissions: Those students who were applying the for Dutch Bangla Bank HSC Scholarship 2018, you should need to submit given bellow document. All candidates for HSC application need to submit recent passport size photo with scan and must color photos. All candidates parents need to submit recent passport size photo with scan and must color photos. SSC or Equivalent examination certificates and mark sheet need to submit. HSC or Equivalent examination certificates or testimonial or mark sheet need to submit. Dutch-Bangla Bank is Bangladesh’s most innovative and technologically advanced bank. Dutch-Bangla Bank Ltd stands to give the most innovative and affordable banking products to Bangladesh. Amongst banks, Dutch-Bangla Bank is the largest donor in to social causes in Bangladesh.It stands as one of the largest private donors involved in improving the country. Dutch-Bangla Bank is proud to be associated with helping Bangladesh as well as being a leader in the country’s banking sector. Next articleHow to Apply for Torrento University Admission Scholarship?